1. Scratching itself on the tank. If you notice any of these problems, check your aquarium conditions immediately. Symptoms : White growths on the body that is fluffy in appearance. These growths can also be found on the fin areas. Treatment : Spot treat with gentian violet or methylene blue; use aquarium fungicide in extreme cases. Cause : Usually Saprolegnia species, occurring after other infection has set in. Treatment : Commercial fungus treatment or methylene blue. Symptoms : Worms showing through the vent; emaciation. Cause : Different varieties of intestinal worms. Treatment : Standard fungus cure or a prescribed anthelminthic given in the diet. Add 1 table-spoon of aquarium salt for each 5 gallons of water to help with osmoregulation. Change 10 percent of the water daily. Cause : Bacterial infection, physical injury to swim bladder from fighting or during transportation from dealer, poor water quality. Treatment : Treat with an antibiotic in a clean, shallow tank. Change water frequently. Symptoms : Inflamed rays; thorn, ragged or disintegrating fins. Causes : Either poor water quality or fin injury is the main cause of this disease, a highly contagious bacterial infection that can completely erode the finds and tail all the way down to the body. Fin rot is frequently followed by a secondary fungal infection. Treatment : Spot treat infected areas with gentian violet. Add 1 tablespoon of aquarium salt for each 5 gallons of water to help with osmoregulation. Frequent water changes are necessary to help improve your beta’s condition. Symptoms : Inflamed eyes protruding from their sockets. Often the eye will develop a haze that is white in color. Inflamed eye sockets are also common. Causes : Parasites or poor environmental conditions. Treatment : The only thing that you can do to help your betta overcome pop eye is to improve the aquarium’s water conditions with frequent changes and add 1 tablespoon of aquarium salt per 5 gallons of water to help with osmoregulation. Check water conditions with test kits to ensure that they remain within the correct range. Symptoms : A golden-velvet or gray-colored coating on the body or fin areas. 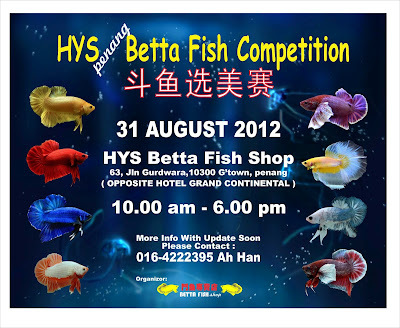 Your betta will look like it has been sprinkled with gold dust. Cause : Oodinium parasite. The adult parasites will attach themselves to your betta and then fall off after period of about one week. These parasites will sink down and begin to multiply. The new parasites are then released into the water and will reinfect the fish in your aquarium. If the parasites cannot find a living host within a period of about three days, they will die. Treatment : Commercial malachite green remedy. Add 1 table spoon of aquarium salt for each 5 gallons of water. Symptoms : The appearance, on the body or fins, of small white spots that resemble little grains of salt. Fish that are infected with ich will scratch themselves during the advanced stages of this disease. Cause : Ichthyopthirius parasite. Adult parasites will fall off the host, sink to the bottom of the tank, and multiply. New parasites will be released to find another host. Treatment : Commercial ich remedies (formalin or malachite green). 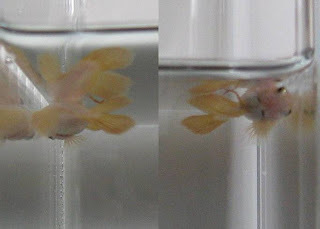 If the afflicted betta is removed to a quarantine tank, the main aquarium’s water must still be treated to kill of the remaining free-swimming parasites. Symptoms : Blood streaks appear on the fins and body. Other symptoms include hemorrhages, listlessness and refusal to eat. This disease usually occurs after a fish has been afflicted with fin rot or skin infections. Cause : Pseudomonas or Streptococcus bacteria. Treatment: Antibacterial Furan2 or Triple Sulfa. Change the water every 24 hours. Symptoms: Dull-colored body, clamped fins, weight loss, ulcers, and pop eye in some cases. Causes : Bacterial disease that is highly contagious. WARNING! This disease can be transferred to humans through contact with the infected areas. Treatment : There is really no effective treatment of this disease and in my opinion is not worth risking your own health in order to try any remedy. Strict care must be used when handling infected animals! Plastic gloves are recommended when removing the infected betta from the aquarium. A betta that has this disease should be euthanized IMMEDIATELY. Symptoms : Disk-shaped parasites can be found attached to the skin of the betta. Ulcers can be sighted near the point of parasitic attachment. Bacterial or fungus problems may follow. Cause : Crustacean parasite. After feeding on the skin, the adult parasite will leave its host and lay gelatin-like capsules full of eggs. Often the eggs will not hatch until the temperature rises, and may stay in the tank for long periods of time. Treatment : Remove the parasites from the betta with a pair of small tweezers. Dab any wounds using cotton swab that has been dipped in Mercurochrom. Remove water from the tank and sterilize all the things in it. Unfortunately, the only real way to correct this disease problem is to start a new tank. Symptoms : Labored respiration, scratching, glazed eyes and loss of motor control. Symptoms : A gray coating on the body or fins, scratching, frayed fins and shimmying. Treatment : Commercial remedy of malachite green and frequent water changes. Short-term formalin and salt baths will help as well. Cause : Organ failure from cancer or poor environmental conditions. Treatment : Antibacterial should be given through medicated food. Improvement of water quality through water changes will help to clear up this disease. Full recovery from dropsy is rare. Symptoms : Poor appetite, swollen stomach region, inactivity. 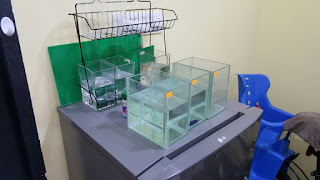 Treatment : Fast your betta for several days. Add 1/2 teaspoon of magnesium per gallon. Change your betta’s diet to live food for several weeks.